[WIP] Freezetag - Update: Ask and ye shall receive , proximity based thawing is here! If you've ever played Quake 3 you have probably seen freeze tag/freeze rail, the game mode also exists as a mod for various other games, such as Team Fortress 2. On spawning you are given two weapons, a "freeze rifle" and a "thawsaw". The gameplay mechanic is fun and simple, it is a team based game mode where shooting someone on the opposing team freezes them in place, making them unable to move. You can thaw/unfreeze players on your own team that are frozen by using the thawsaw on them, if all members of one team are frozen at the same time, the other team wins. This introduces a more interesting gameplay mechanic than simple teamLMS instagib as the option to unfreeze players on your team provides another layer of tactics; for instance players you have frozen can act as bait or a "trap" for other players on the opposing team who might rush in carelessly to unfreeze their teammate while you hide away, shooting them as soon as they get near the frozen player. The wad itself will contain no maps, only scripts, decorate and other needed lumps for the game mode, which can be loaded with any of your favorite wads that contain mapsets with deathmatch starts. I also plan to extend this to allow for further possibilities, such as freezetag CTF. Update: Now with proximity based thawing! Notice on the right someone has just unfrozen his team mate with a thawsaw. The more players there are the more fun this is (unless the map is too small). DOWNLOAD: Get the wad here http://www. [bad site]/wads/, control+F ftagb and choose the wad with the highest number, you need to reset the map once (using map command) for everything to initialize, also you should set sv_noteamswitch to true as team switching mid game can cause the game to crash. Find a way to track a player's damage to others so as to award individual "frags". Good looking freeze rifle and thawsaw sprites? Last edited by Hypnotoad on Tue May 21, 2013 12:03 am, edited 1 time in total. I'll try and look at it, it played well though. A few odd problems, but i was pleasantly surprised. Or maybe an alt-fire on the same weapon? This would be a cool wad to have scims on! Keep up the good work! 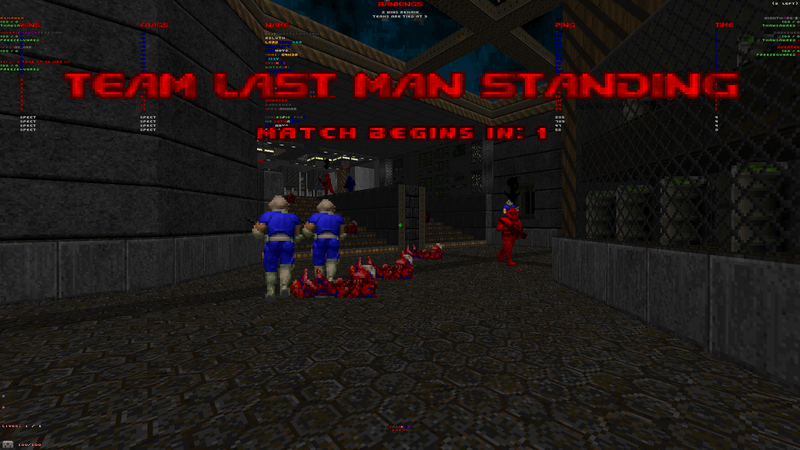 Cool, finally someone decided to port freezetag to Doom. This is fun though, would love to have a good games of this. Last edited by one_Two on Fri Mar 01, 2013 4:54 pm, edited 1 time in total. What is wrong with a thawsaw? That is how it works in quake 3. Finally someone decided to do this for Doom. 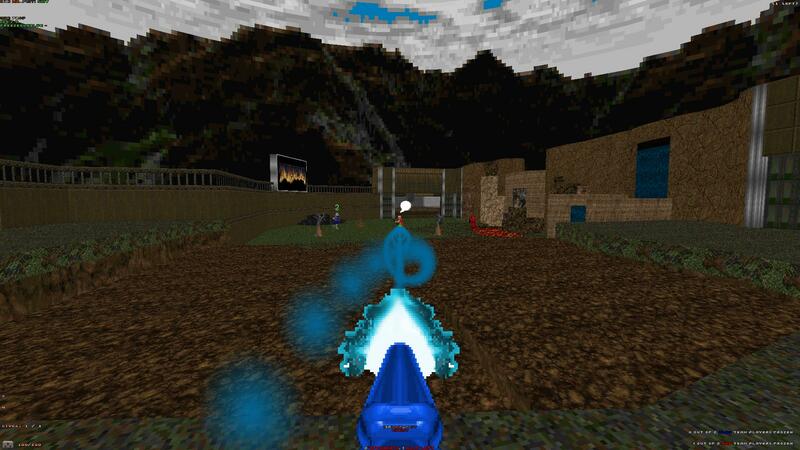 Also what's the mod called in Quake 3? Because I have one called F4A (Freeze For All) and in that you thaw the other players by standing near them. Players are also able to freeze their opponents with any weapon. It was called freeze tag, I think there were different versions and in some you could simply stand near the opponent while in others you have to use your gauntlet. Most of the time you only had the rail gun and gauntlet, although sometimes you could use any weapon. I will look into using proximity instead of the thawsaw, if it is possible to do via acs. Last edited by Hypnotoad on Fri Mar 01, 2013 6:03 pm, edited 1 time in total. Hypnotoad wrote: What is wrong with a thawsaw? That is how it works in quake 3. I am not sure what freezetag mod you were playing for quake 3, but i remember the way to thaw someone was to stand by them for a couple of seconds. After playing it for a while i enjoyed it :)!. Already stated my opinions on #brit but keep up the good work!. So the basic game mode is 99% done ACS wise, had a session on UDMX earlier and no major bugs occurred. However it is a little difficult to get a game going, I think partly because it is difficult to decide on the right mapset for this. If anyone has any suggestions I am all ears, the mod is compatible with both dm/lms and ctf mapsets (I can use ctfstarts, although for some reason dm starts still need to be in the map for that to work), ideally the maps should be somewhat spacious with hiding or camping spots (although some may disagree with that). This mod has the potential to be excellent fun when enough people are playing, but my possibly subpar choice of mapsets so far may be hindering this. edit: I am away until wednesday so there will be no updates until then for now. Last edited by Hypnotoad on Sun Mar 03, 2013 5:21 am, edited 1 time in total. STLMS maps are made for stuff like this and are great maps. Also, it would be cool to make a "stand near and thaw" feature, with a little hudmessageonactor thing with a bar over their head showing you thawing them, with a serverside cvar to determine how long it takes to thaw someone and if the gamemode should use the thawsaw or the nearby method. Should be really easy to do in ACS. Last edited by Llewellyn on Sun Mar 03, 2013 8:08 pm, edited 1 time in total. Apparently STLMS is broken, something about line teleports not working. Fixed some serious bugs, no longer will the exit break the game if sv_noexit is on. Added a CVAR: FT_FRTIME that determines in seconds how long you stay frozen for when shot, 0 means you are frozen forever and is the default. Added some on screen info, including who got frozen and thawed, and the amount of people on each team frozen. Last edited by Hypnotoad on Fri Mar 08, 2013 8:14 pm, edited 1 time in total. All right, those Freeze rails are awesome. Any chance of making the center rail use the player's rail color like the ST railgun does? This looks great.. However the Text in the Center Top is a bit.. Meh for me. I use Center Text so, it gets in the way. It also overlaps if there is many Players playing..
Other then that, I like it. Though even in Minigames Map02, people hate waiting heh, but isn't that the Point of LMS anyhow? DevilHunter wrote: I use Center Text so, it gets in the way. It also overlaps if there is many Players playing. Center Text, as in the chat/server message text? I had no idea you could even do that, or why anyone would want to. Where else should those messages go?